A bug leads to a journey into the resolution logic of Bundler (and a fix that speeds things up immensely). How to use simple tools to measure the allocated and long-term memory usage of your apps. 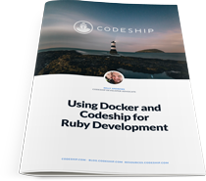 Check out this free eBook by Codeship Dev Evangelist Kelly Andrews and learn how to use Docker and Codeship to develop and test a Ruby app. Understanding the concepts and implementation of CSRF in Rails by walking through the code. The methods available on enumerable objects in Ruby make it easy to do powerful transformations on your data. A new onslaught of "Rails is Dead" posts is addressed in this post about the history of Rails and why its future is just fine. Tips on setting up the process and tools for keeping your i18n translation files healthy. Is your Rails app fast? Speed is the most important feature. Find out bottlenecks in your code with RoRvsWild. Installing Gemstash on EC2 and allowing access to push and fetch gems for your team. Includes factories, timestamps, external services, and Ajax. Learn how to connect AASM (a state machine for Ruby) with Sequel and how to create a micro Ruby application using Rake, DotEnv, SQLite and RSpec. How to use Ruby and the Shoryuken gem to ensure the order of messages for an SQS queue. A look at the many ways you can tell Bundler how to access private dependencies. Instantly know what's broken and why. Rollbar is monitoring, alerting, and analytics for production errors. Try it.